For players looking for a different sound, the GN20 pairs a solid cedar top with mahogany back and sides to produce a warm, detailed tone that works beautifully for a wide range of musical styles. The slim satin-finish mahogany neck and 12"-radius rosewood fingerboard provide great feel and playability, while the split-saddle design of the pin-less rosewood bridge provides superior intonation for sweeter-sounding chords and single-note runs. 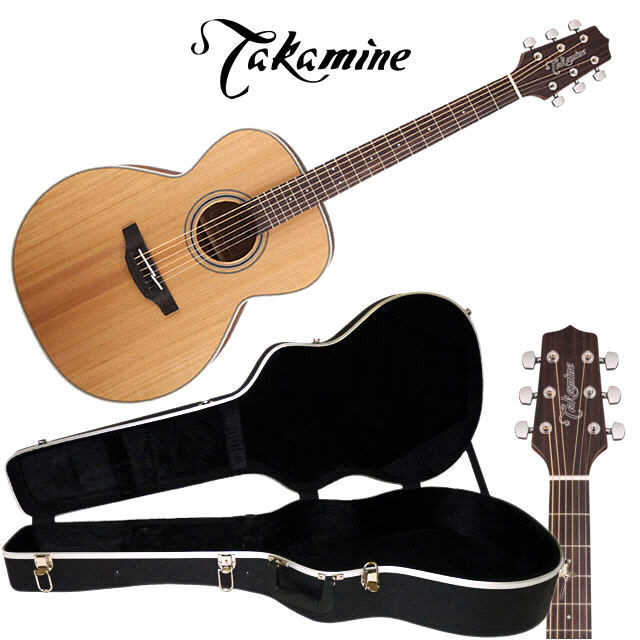 An extremely light weight yet durable guitar case featuring ABS construction & reliable hardware. Extruded aluminium valance/edging provide extra support ensuring both surfaces close securely while chrome latches feature keyed locking. 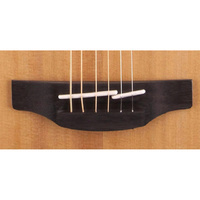 Plush lined EPS foam interior is shaped ensuring neck is supported and instrument held secure. Designed to suit dreadnought and most acoustic guitar body shapes this guitar case combines style with functionality to protect your investment from damage. Strong, super lightweight and easily carried. Built from tough ABS thermoplastic plates, these cases offer heavy duty protection but are light in weight. For more than half a century now, Takamine has proudly dedicated itself to the art of fine guitar craftsmanship. Its longstanding devotion to innovation and continual improvement has placed it among the world's premier acoustic guitar makers, with truly fine instruments that are the first choice of performing guitarists worldwide. 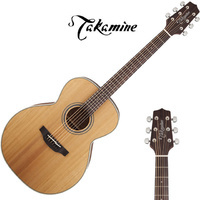 With humble beginnings in 1959 as a small family-run guitar shop nestled at the foot of Mount Takamine in the central Japanese town of Sakashita, the fledgling company took the mountain's name in 1962 and began in earnest the journey that led to the phenomenal success that is the modern Takamine company. We aim to craft guitars in an artful, thoughtful way instruments that take your performance to new heights. High-volume builders use production machinery to speed up their output, but speed isnt the issue for us its the quality of the instrument. We re proud of the level of our craftsmanship, and we invite you to see it for yourself by taking a close look at our instruments, part by part. 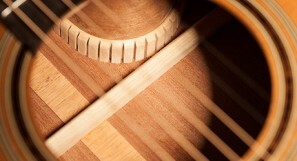 Spruce and cedar soundboards have been used for well over a millennium, and the modern bracing system has been around for at least 150 years. 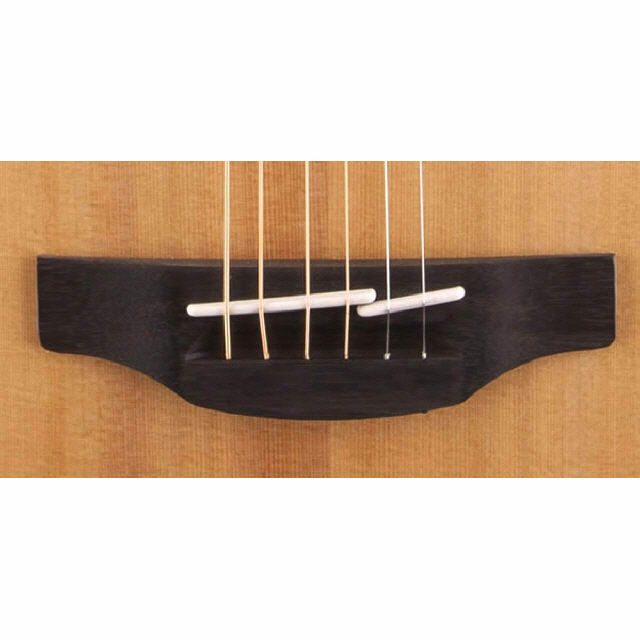 We use a traditional X bracing pattern on our steel-string models, differently voiced for each application. Rather than make any radical departures, we make many small changes that add up to a significant difference in volume, balance and richness. Takamine® soundboards are braced and voiced by hand by tapping each top, a skilled luthier knows just how to shape the braces for the best possible response. 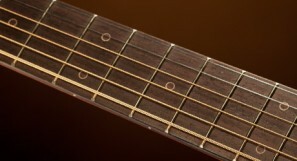 Most guitar makers don't give frets enough credit or attention. 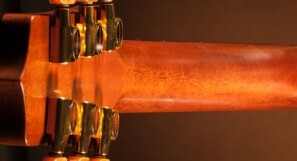 A good fret job can help a player reach new heights. 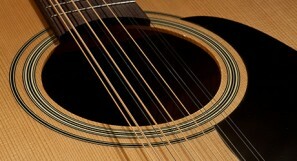 Examine the frets on a Takamine. What you see is the work of a laser-guided fret finishing system that levels and crowns each fret to within 0.0001 of dead-on. Fret a note, notice how the string contacts the center line of the fret perfectly, and hear the clarity when you play. 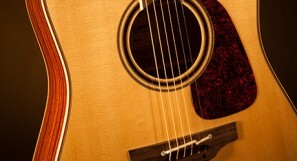 A good fret job can be the difference between a nice guitar and a great guitar. 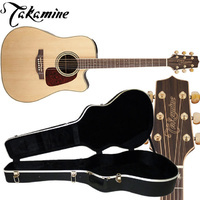 Takamine pioneered the use of uncommonly artistic and complex inlay work on guitars for working players. We've developed the art of design and the craft of precise inlay work far beyond the capabilities of most other guitar makers. Your Takamine is beautiful on the outside, but beauty is more than skin deep. Look inside and see for yourself finely sanded braces and meticulously cut linings display a level of hand craftsmanship fast disappearing from modern guitars. There's a century-old phrase from the arts and crafts movement: Anything worth doing is worth doing well. That spirit lives on today at Takamine. 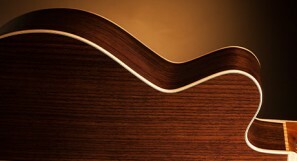 With their many distinctive curves, guitar bodies accommodate a wide range of frequencies. Different body shapes favor different frequencies, giving them a distinct tonal character. Dreadnoughts are typically louder, with stronger lows. Smaller bodies, such as our NEX, tend to be more balanced. A thinner body may project less but sound more pleasing. Play as many sizes as you can with comfort and sound in mind. Your choice is very personal what sounds and feels best to you. A century ago, the wide classical shape with a flat fingerboard was the only shape considered proper,but we've become more open-minded since then. Some players feel you can never be too thin, while others feel it's far better to be fat. It's that personal taste thing again. 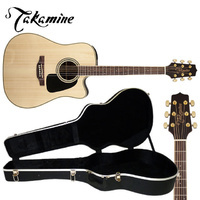 Takamine necks have an asymmetrical C shape an ergonomic contour slightly thinner on the bass side of the neck so that it fits the natural shape of your hand. 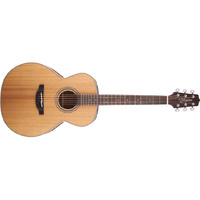 Overall, it's thin from front to back and medium in width, with a gentle fingerboard arch. Perfectly comfortable.